Born nearby Taranto, after the high school I moved to Genoa for 5 years getting the master’s degree in marine Engineering and Naval Architecture. 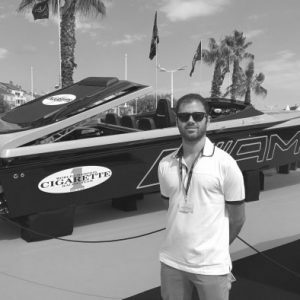 In 2014, I joined the NavalHEAD team as Hydrodynamics & Propulsion Department specialist so I began my professional career in Trieste, where now I live and I work. Going back in my memory, I remember that when I was kid I used to exploit every opportunity, every minute, in every season, to stay in contact with the sea. Today, the passion and love for the sea have not changed and they took me to work in this fascinating marine engineering sector. Among my other passions there is basketball, sport that I follow and I currently play at amateur level, after an agonistic interlude of 12 years. When I can, I spend my time to practice freediving and underwater spearfishing, activities that have taught me to admire and, above all, to foster respect for the underwater world wonders. I like professional challenges, innovative projects and the study of advanced solutions. My major interests in NavalHEAD are basic design, stability calculations in accordance with current safety standards and comfort and hull hydrodynamic optimization through the use of computational fluid dynamics (CFD) software and towing tank tests.